Last time I wore a watch was when I was 10. I didn’t see the need to wear one again after that - until now. For all things that a phone (smart or dumb) could do, it included the most basic function of telling the time. Which made wearing watches seem redundant unless that watch could do another new thing and actually add value to your wrist. 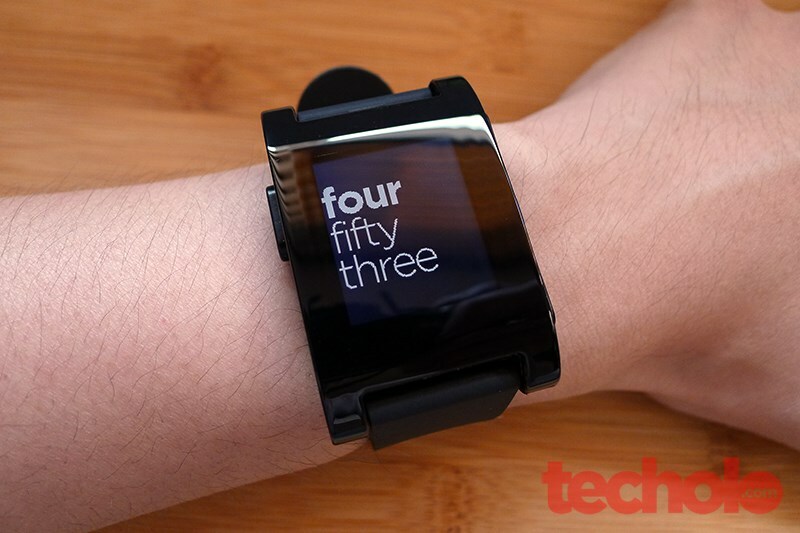 The Pebble Smartwatch may be the start of a new trend in smart watches in nearly a decade after Microsoft SPOT watches failed to deliver on the promise of a connected wrist wear using FM radio broadcast signals. 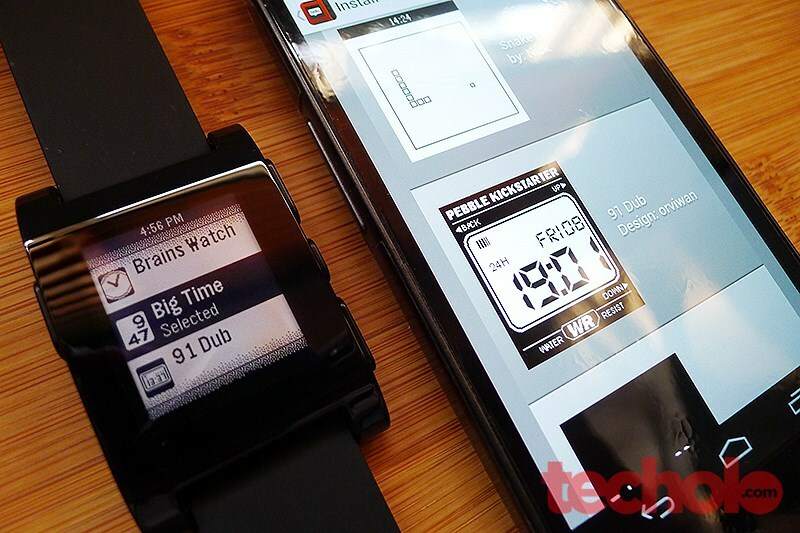 Pebble started as a humble Kickstarter campaign by Allerta, the same company who made inPulse, a Blackberry-only watch. This time, it was backed by thousands and made more than $10 million pledges making it the most funded Kickstarter project to date. Pebble’s uses an low-power e-paper 1.26” display (from Sharp) and runs a customized PebbleOS which can communicate thru Bluetooth to either iOS or Android. The watch itself tells the time and allows different watch faces but it will need a connection to an active phone to sync in notifications from text messages, phone calls, music controls and much more. 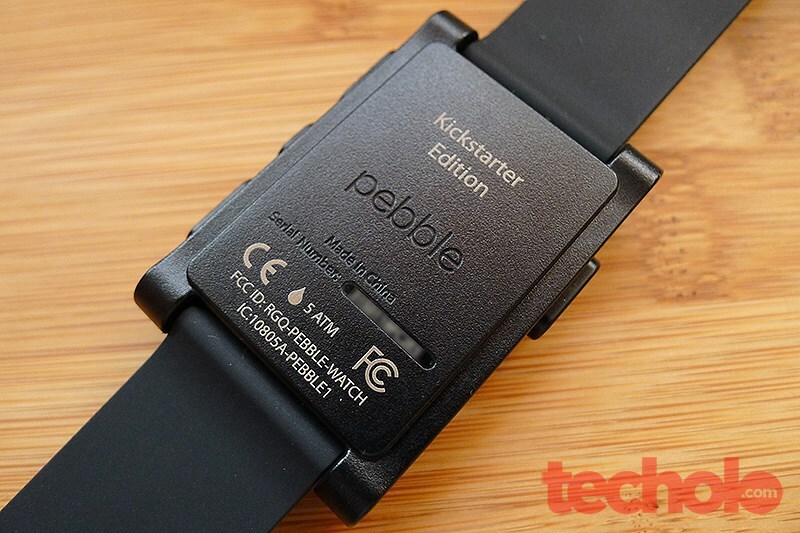 Pebble was announced to be shipped last September 2012 but due to the spike in interest and demand, they were forced to move the shipping date to February 2013. It actually took this a year to arrive to me since backing this last April 2012. 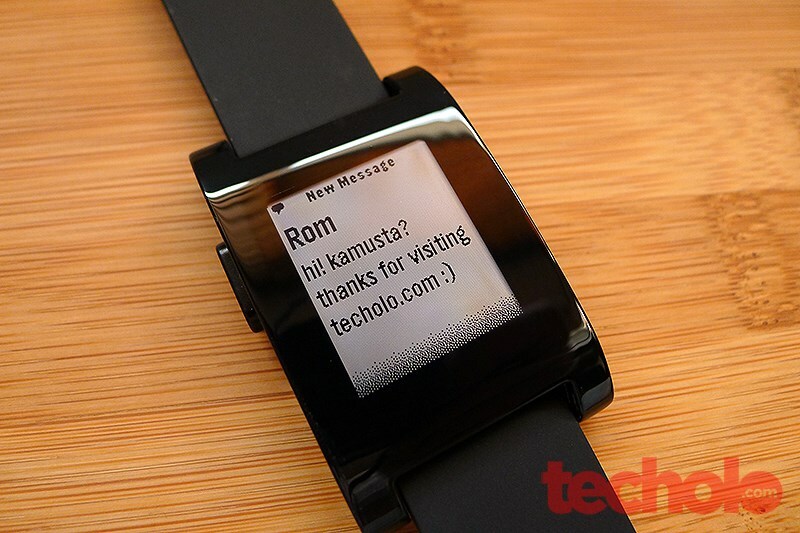 Well, at least the Pebble team never lost communication and really provided weekly updated thru Kickstarter and their online forum, even hosting an ‘Ask Me Anything’ session on Reddit. 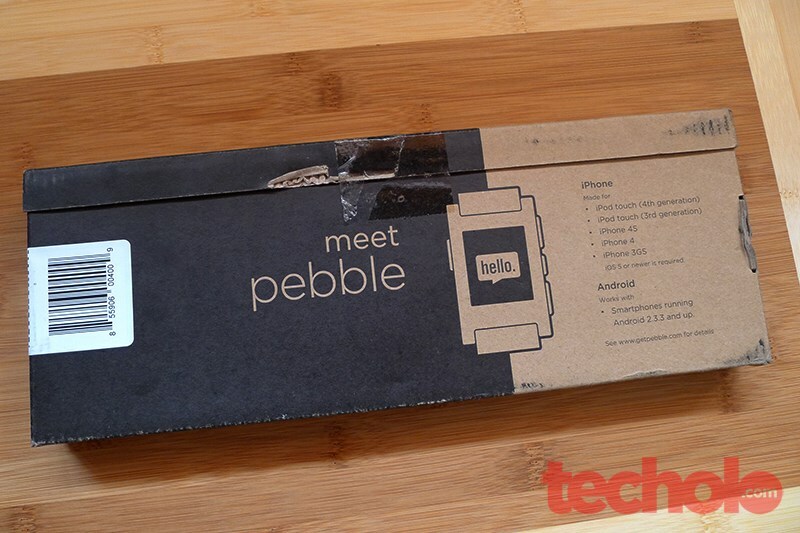 The Pebble packaging is a simple corrugated brown box with sealed cutouts that resemble a breakfast cereal packaging. Pretty straightforward. Inside is the watch with the included charging cable. That’s it. 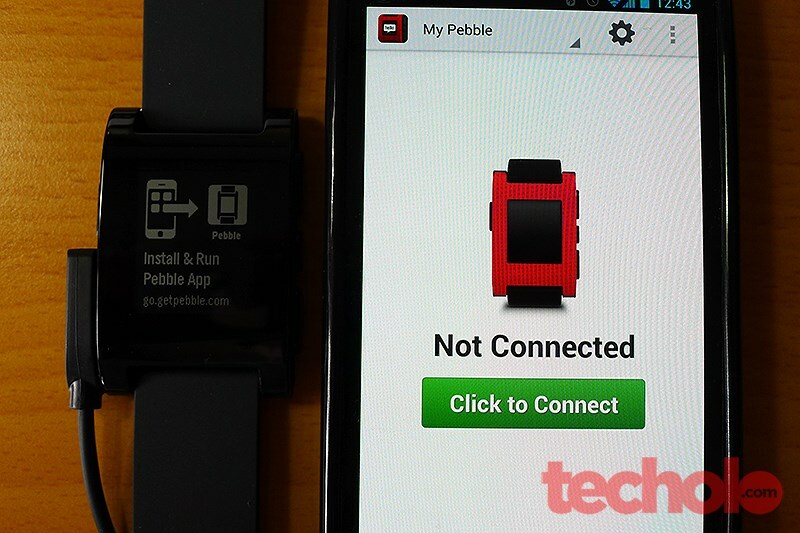 No manuals or any other documentation included besides the note to proceed to go.getpebble.com. 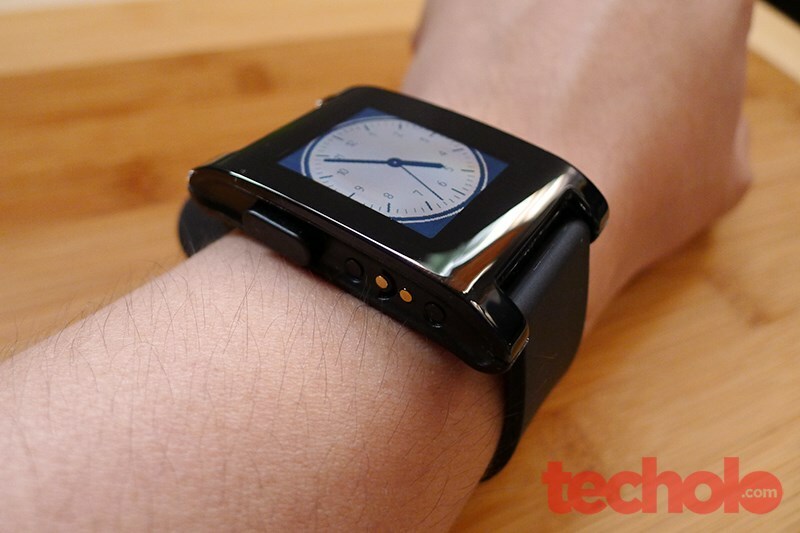 What got me interested with Pebble beyond what the software promised was the water-resistant feature and battery life. The Pebble’s sealed internals required it to have a different type of charging cable. 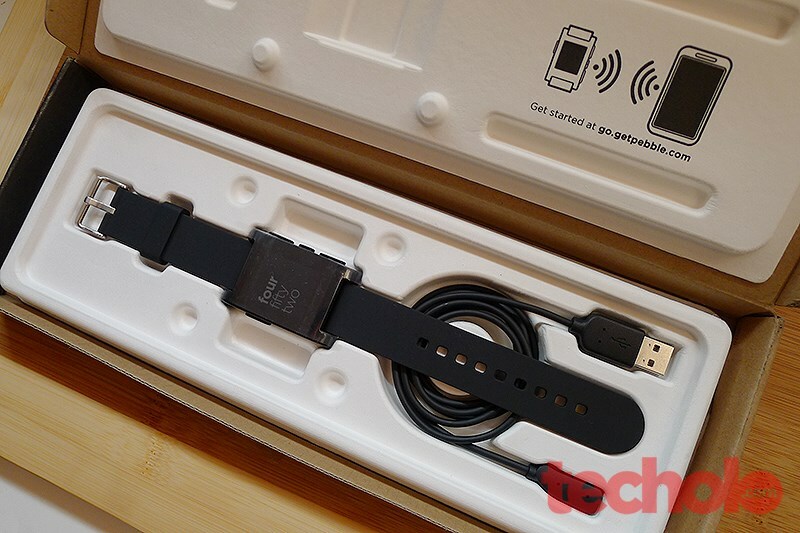 The included cable magnetically locks into the left side of the watch ala Apple’s Magsafe, and then aligns itself with the connectors in place. The battery life of Pebble is advertised to last over 7 days but my actual usage went beyond 10 days, and probably more if I hadn’t charged it. Granted I disabled the vibration on some occasions but the energy efficient Bluetooth 4.0 and E-paper made all the difference. 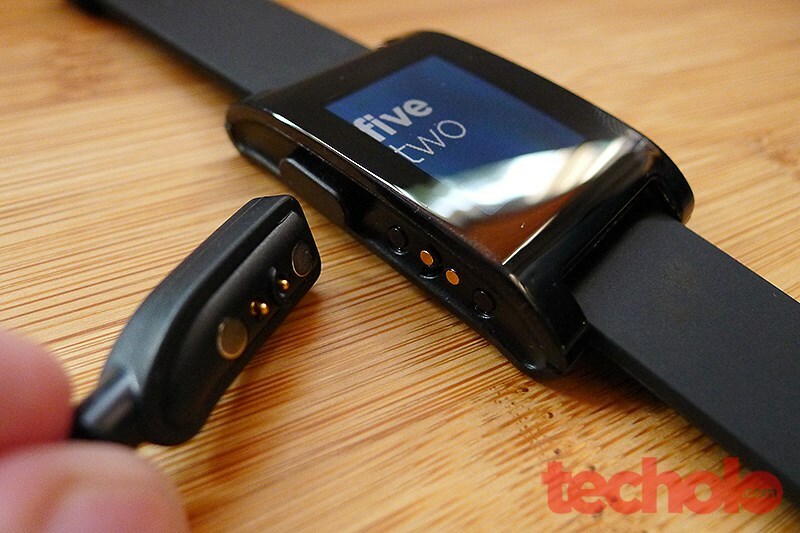 Pebble has a number of interesting hardware specs despite its diminutive size. It has a built in 3-axis accelerometer with gesture detection, a magnetometer, an ambient light sensor, the backer-requested and power-efficient Bluetooth 4.0 and the vibration motor. The watch is made of durable plastic that can withstand normal light scratches. 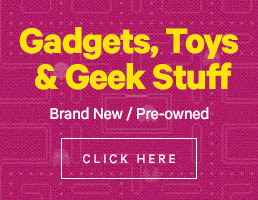 I haven’t tried in on mine since I installed a screen protector the day I got it. The screen however showed some LED tinges which was explained to be normal and caused by e-paper display production. It was not visible most of the time so I have no issues with it. The backlight was just enough to show the information on a dark lit room but not too bright to cause attention to your wrist on a movie theater for example. 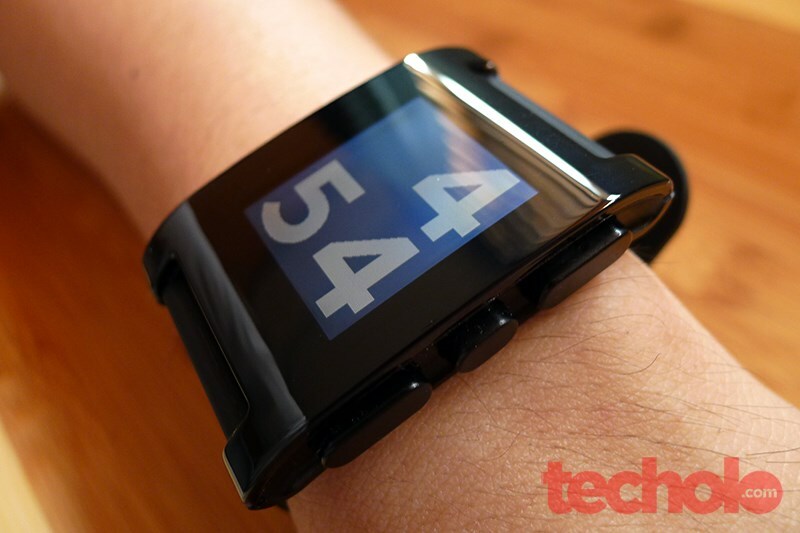 The straps can be replaced with any 22mm watch bands which makes Pebble very customizable to each individuals taste. 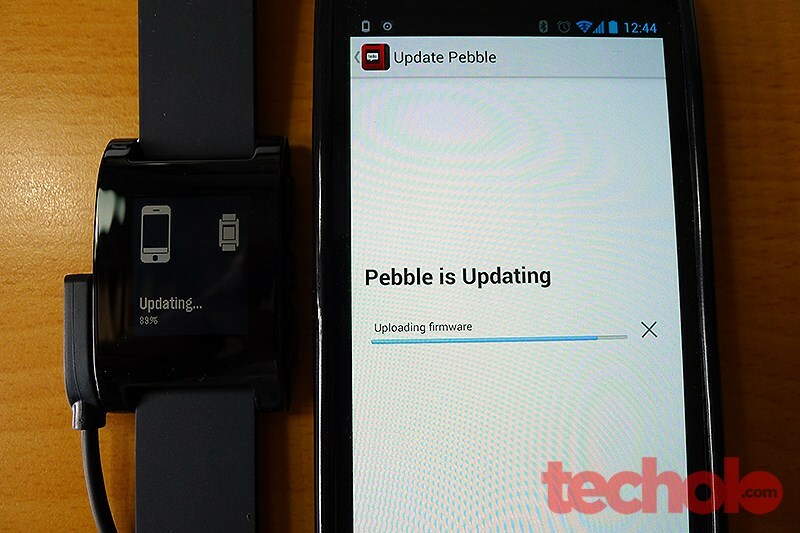 Firmware updates for the watch is coursed through the Pebble app. 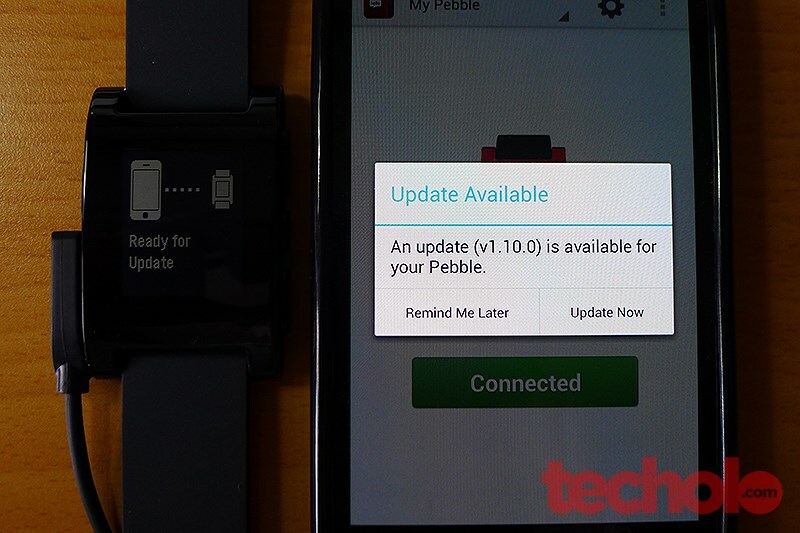 Opening Pebble for the first time alerted me to the most recent update (which fixed the shutdown bug on earlier builds) Updating the Pebble is simple and dumb-proof. 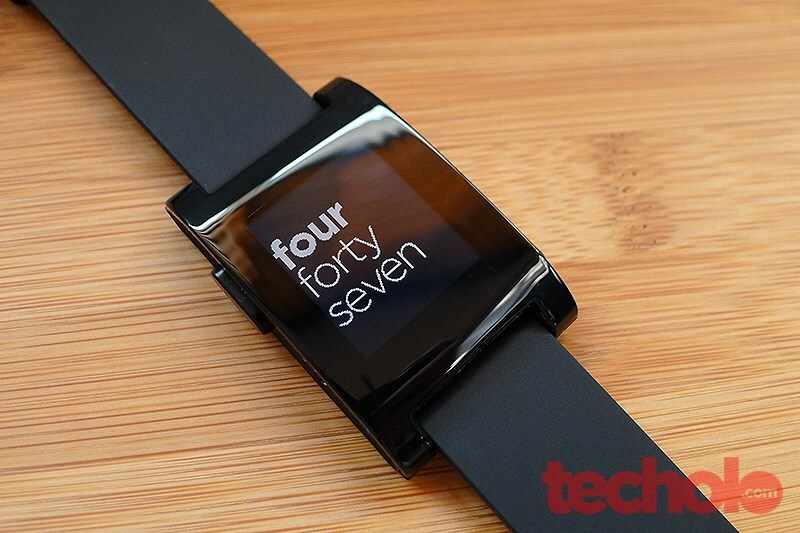 Pebble is controlled by just 4 buttons. 1 on the left and 3 on the right. The left button is the back button and the 3 buttons on the right are up, select and down buttons. 3rd-party apps are still no-show right now but users can already download 3rd-part watch faces from difference source, one of which is My Pebble Faces. There is even a working Snake and Tetris game that I have tried. Fun for a few minutes though. The watch can only handle at most 9 (at least on mine) so you’ll have to erase one if you’ll be adding more. The Pebble Team is in the process of releasing the SDK for 3rd-part app developers to use on their services like Freecaddie. With the different built-in sensors in place, developers can really get creative. So far, I like Pebble. While haven’t tried it on iOS, It works well on my Nexus 4 without any problems. The Pebble app does the job but I think it could still do more useful/advanced features like allow Alarm settings thru the phone or more notification options. I really appreciate the fact that I can check my phone while on-the-go quickly and without fear of it being swiped straight out of my hand. 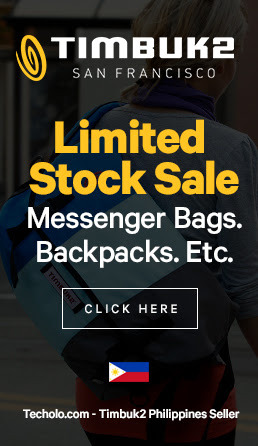 It’s a nice safety measure to be able to read text messages and even cancel incoming calls while riding the jeep, or LRT without risking pulling out the actual phone. Silently glancing emails or text messages during moments that I normally couldn’t was also a nice thing. It didn't require me to respond immediately (if I didn’t want to) as it was a one-way notice but at least I got the message. If you also sleep with someone, having a loud alarm just for yourself seems a bit inconsiderate. With Pebble's vibrating alarm feature, I used it most of the time, to wake me up, silently. No, I don’t use my phone under my pillow as I don’t want to risk getting my brain fried. 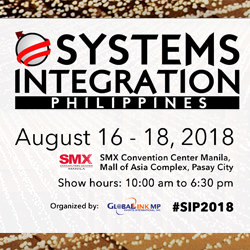 The potential for it to be a game-changer may still not be there yet but I believe that it’s among one of the most usable smart watch that we can have right now.